Reasoning Ability is an onerous section. With the increasing complexity of questions, it becomes hard for one to give it the cold shoulder. Today is the Day 8 of the 60 Days SBI Clerk Prelims Study Plan. The only way to make the grade in this particular section in the forthcoming banking exams is to practice continuously with all your heart and soul. 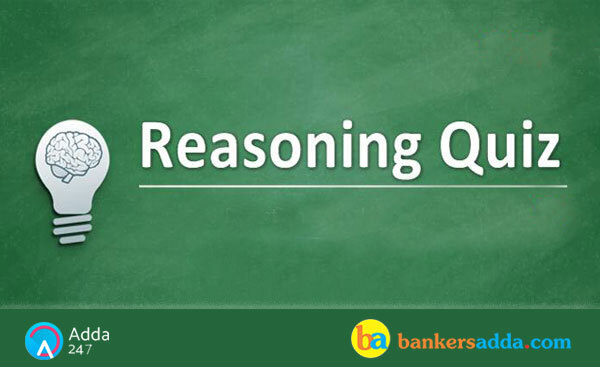 And, to let you practice with the best of the latest pattern questions, here is the Adda247 Reasoning Quiz based on the study plan and the exact same pattern of questions that are being asked in the exams. A, E, D, G, B, F, H and H are eight persons sitting around a circular table. Four of them are facing towards the centre and four of them are facing away from the centre. Each of them like a different sport person viz. Usain bolt, Lance armstrong, Michael jordan, Floyd mayweather, Virender sehwag, Cristiano ronaldo, Hershel walker and Kobe bryant, but not necessarily in the same order. The one who likes Michael jordan sits opposite of F. The one who likes Lance armstrong is not the immediate neighbour of F and faces away from the centre. A sits second to the left of D and likes neither Hershel walker nor Kobe bryant. The one who likes Hershel walker is an immediate neighbour of C and F. E faces away from the centre and does not like Lance armstrong. B faces towards the centre and likes Usain bolt. Both the immediate neighbours of B face away from the centre and likes either Michael jordan or Floyd mayweather. G faces away from the centre. Both the immediate neighbours of G face towards the centre. B sits third to the right of F, who likes Virender sehwag and faces away from the centre. D sits third to the left of F.
Q1. Who sits third to right of the person, who sits opposite to H? Q2. Who among following is sits second to right of G? Q3. D likes which of the following sport persons? Q4. G likes which of the following sport person? Q5. Who among following sits third to left of H? Directions (6-7): In the questions below are given some conclusions followed by five set of statements. You have to choose the correct set of statements that logically satisfies given conclusions either definitely or possibly. Assume the given statements to be true even if they seem to be at variance from commonly known facts. Q6. Conclusions: Some black is not nose. No eye is nose. (a) Some black is red. All red is hair. No hair is nose. Some nose is blue. All blue is eye. (b) Some black is hair. No hair is red. Some red is blue. All blue is eye. No eye is nose. (c) Some black is nose. All nose is red. No red is hair. All blue is hair. No hair is eye. (d) Some black is eye. All eye is red. No red is nose. Some nose is hair. All hair is blue. Q7. Conclusions: Some wood is not water. No fruit is root. (a) Some root is fruit. All fruit is cloud. No cloud is bird. Some bird is wood. All wood is water. (b) Some root is wood. All wood is fruit. Some fruit is cloud. All cloud is bird. No bird is water. (c) All wood is bird. Some wood is fruit. All fruit is cloud. No cloud is water. All root is water. (d) Some wood is bird. Some bird is fruit. All fruit is water. Some water is root. Some root is cloud. When a word and number arrangement machine is given an input line of words and numbers, it arranges them following a particular rule. The following is an illustration of input and its rearrangement. Step VI is the last step of the above arrangement as the intended arrangement is obtained. As per the rule followed in the given steps find out the appropriate steps for the given input. Q8. In which step the elements ‘teen 43 ant’ found in the same order? Q9. Which of the following is the fourth element from the right end in step III? Q10. In step IV, ‘dust’ is related to ‘25’ and in Step II ‘mold’ is related to ‘19’. In the same way in Step III ‘large’ is related to? Students let us understand the Logic behind this Question and let’s understand how to solve it. When we see the each step, then we can find that there is both number and words are arranged in each step. (i) Words are arranged in descending order as given in English dictionary from left to right. (ii) There are three prime number and three odd numbers. In first three steps prime number are arranged in descending order from left to right and in next three step rest of the odd number are arranged in descending order from left to right. Directions (11-13): In each of the questions given below, a group of digits is given followed by four combinations of letter/symbols numbered (a), (b), (c) and (d). You have to find out which of the four combinations correctly represents the group of digits based on the letter/symbol codes and the conditions given below. If none of the four combinations represents the group of digits correctly, give (e) i.e. ‘None of these’ as the answer. (iii) If the first as well as the last digit is odd, both are to be coded as Z. (iv) If the first digit is even and last digit is odd, both are to be coded by the code for the first digit. (v) If 0 is preceded and followed by odd number then 0 is coded as %. Directions (14-15): study the following information and answer the questions given. ‘go lu na fu’ means ‘rotten of the us’. Q14. What is the code of ‘clever’ in this code language? Q15. What is the code of ‘yeast’ in this code language?